Following the recognition of the “NFC Mobile Credit Card: The Next Frontier of Mobile Payment?” research paper as the most cited and most downloaded paper, Faculty of Business and Finance senior lecturer Garry Tan Wei Han’s research paper unlocked another achievement when it was recently awarded the “Top Cited Author (2014-2017)” by Elsevier (USA) for the Telematics and Informatics Journal. The research paper was awarded based on the number of citations received, which was 138 citations from 2014 to 2017. It was co-written by Ooi Keng Boon from UCSI University, Chong Siong Choy from the Finance Accreditation Agency and Hew Teck Soon from University of Malaya. The high number of citations also contributed to the paper being acknowledged as one of the “Most Critical 50 Highly Cited Paper” in 2015, in an article titled “Citation-based analysis of literature: A case study of technology acceptance research” under the Scientometrics Journal (Springer Link, USA). The article presents a case that examines the Technology Acceptance Research through newly developed citation-based approach. 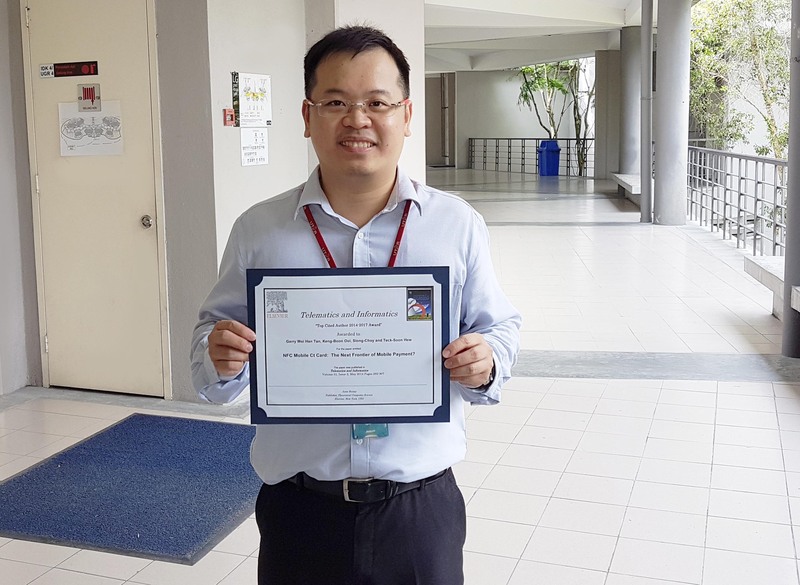 From a total of 1555 journal articles published from 1989 to 2014 using Thomson Web of Science (ISI; WOS) database, Tan’s research paper was identified as one of the 50 highly cited papers. The paper is also ranked alongside with the authors for the Technology Acceptance Model (TAM) (Fred D. Davis), and Unified Theory of Acceptance and Use of Technology (Viswanath Venkatesh, Michael G. Morris, Gordon B. Davis and Fred D. Davis). In addition to the other achievements, the “NFC Mobile Credit Card: The Next Frontier of Mobile Payment?” was also published in the book, titled “Mobile Phone Behaviour” (2017) by the author Zheng Yan, an Assoc Prof at the State University of New York in Cambridge University Press. Tan's research focuses mainly on the behaviour of consumer in the adoption of mobile commerce. He has been acknowledged as the world’s “10 Most Productive and Influential Authors in Mobile Commerce and Applications” by Thomson WOS Publications between 2000-2015 and also one of the "Top 10 Authors in the World" in the area of Online Banking, Information Technology and TAM by Thomson WOS Publications between 1998-2017. Telematics and Informatics Journal is currently indexed with Thomson Reuters (ISI); Social Science Citation Index (SSCI); JCR-2016, IF = 3.398.